With increasing sales of high-resolution digital cameras, video camcorders and other electronics devices that require more memory capacity and speed, SanDisk Corporation today announced the 4-gigabyte (GB) SanDisk Ultra II Memory Stick PRO Duo card. The addition of this card to its high-speed SanDisk Ultra II line of flash memory cards represents a doubling of its highest capacity card in this card format. The announcement was made at the Photo Marketing Association trade show where SanDisk is demonstrating its products. 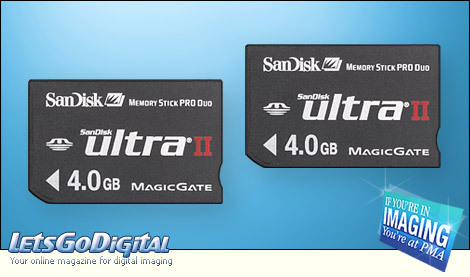 SanDisk Ultra II memory card - The Ultra II cards are primarily targeted to advanced digital photographers with high-resolution digital cameras that require fast, large-capacity digital film cards to quickly shoot many high resolution images. Each SanDisk Ultra II card features a minimum write speed of 9 megabytes per second (MB/sec.) and a minimum read speed of 10MB/sec. These fast write speeds are designed to take advantage of advanced digital camera features such as rapid fire, continuous-shooting modes or to capture digital video clips. About SanDisk - SanDisk is the original inventor of flash storage cards and is the world's largest supplier of flash data storage card products using its patented, high-density flash memory and controller technology. SanDisk is headquartered in Sunnyvale, CA and has operations worldwide, with more than half its sales outside the U.S.